Potatoes have always been my favorite. So much so that in fourth grade when we had to write a song or poem about our favorite food, while everyone else penned odes to bacon and chocolate cake, I gushed about the humble spud. To the tune of “My Guy” by Mary Wells. (You may recall that Sister Act was popular at the time, in which they also made their own version of the song.) Not a naturally gifted singer, I belted something out about “my potato,” and how much I loved it baked, roasted, mashed, and fried. Twenty years later, I can tell you not much has changed. Although I’ve discovered and eaten more types of food than I ever dreamed of as a child, potatoes still remain my ultimate comfort food in all forms. And mashed is a whole other level of comfort. My favorite way to make mashed potatoes lately is actually smashed with the skins still on and mixed with tangy sour cream. It gives the spuds a luxurious quality and amazing flavor. Throw some chopped scallions in there and you have yourself a side dish to go with steak (as I did the other night) or chicken, veggies or tofu. Today’s blog hop is all about potatoes, and I can’t wait to see what your favorite preparations are. 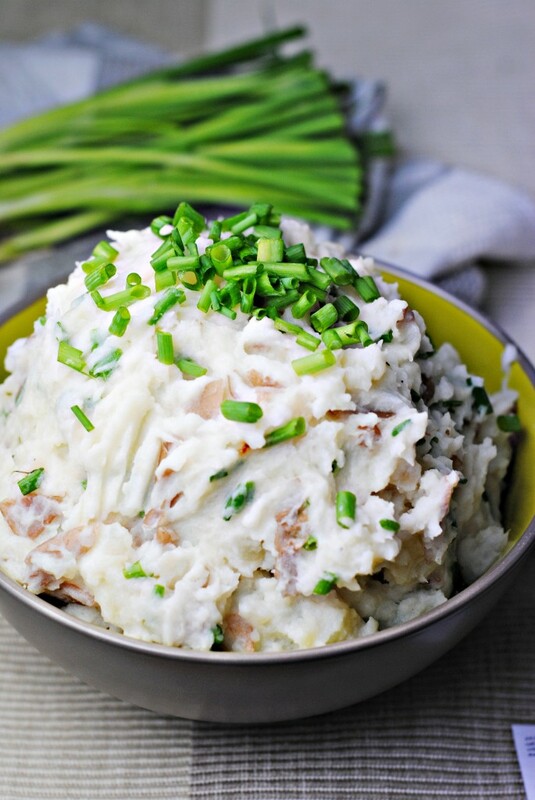 Sour cream and scallion mashed potatoes come together quickly using just a few ingredients and make the perfect side that is naturally vegetarian and gluten free. Put the potatoes in a large pot of salted water and bring to a boil. Simmer until the potatoes are soft, 15 to 20 minutes. Drain the potatoes and return to the pot. Add the warmed milk and mash with a potato masher or wooden spoon. Add the sour cream and continue mashing until you reach the desired consistency/smoothness. Stir in the scallions with a wooden spoon and season with salt and pepper. Serve immediately, topped with additional scallions, if desired. O I love that song too by Mary Wells! It was nice to watch a video of her sing that song again. And then I started to crack up hard when I read your version of the lyrics! =D Potatoes are great, they do taste to good and are so versatile! Hahaha I wish I had a video recording of 10 year old me singing about potatoes. It’s probably better that I don’t! Such a cute story, I can just picture this – sounds like something crazy I would have done! Love these potatoes too, you always have something wonderful. Thanks Liz! It’s such an easy recipe, but so good I just had to post it. I’m loving all the potato ideas on the hop. I love mashed potatoes Katherine and yours looks beautiful! Potatoes are definitely one of the ultimate comfort foods! Thanks for hosting, Katherine! Being from nothern Europe we had potatoes almost every day – my favorite are small fresh potatoes usually get during the summer time – served with dill and herring YUM!! But they are hard to find here so i prefer baked potatoes when i can’t find the young fresh ones. I love hearing about your background and food traditions! Young fresh potatoes are hard to come by in Israel as well so I typically use larger baking potatoes for most everything. We share the same love for potatoes. I can have them in any form and for any number of days. The sour cream addition to smashed potatoes is sounding delicious. Me too! I try not to eat potatoes every day, but I totally could. Once I started adding sour cream to my mashed potatoes I couldn’t stop! I just love the creamy tanginess it adds. I love potatoes and can use them in any dish possible.We have a huge variety of dishes cooked with potatoes in our Indian cuisine – wish I could bring you more!Have linked up my very favorite snack Chicken and Potato sandwich as of now:)Happy hosting! Me too! And I love the use of potatoes in Indian cuisine. Thanks so much for linking up Sudha! Oh yum! We are having steak for dinner and I’m adding this to the list. I think it is adorable that you wrote a song (and sang it in public) about potatoes!!! I hope you enjoy! Let me know. I think this is the perfect accompaniment to steak. I know, I can’t believe I sang in public period, let alone about potatoes! Ha. They were wonderful!! We added a little cheddar because I add cheese to everything! These are right up my alley. They look so decadent and comforting. I love your story! Thanks Anna! These mashed potatoes are definitely comfort in a bowl. I could eat potatoes everyday. Smashed, french fried, baked, heck…I’d probably eat one raw in a pinch 🙂 Loaded with sour cream of course! Just like yours, sooooo yummy! Ha, me too! And yes, I just love sour cream. I love them on my baked potatoes (not going to lie, they end up in 1:1 potato:sour cream) so I figured why not in mashed potatoes? Add me to the potato club. I haven’t met one I didn’t like! These look incredible Katherine. I have a tendency to over mix mine as the kids don’t like any lumps or bumps. But I would much prefer to do smashed with skins on. I must give this a whirl. Hope you are enjoying your weekend. Thank you Kim! I also like super smooth mashed potatoes – well, I like any mashed potatoes! But I do like the texture from the skin. Hope you’re having a great week! I love seeing that you leave the peels on your potatoes! There are so many nutrients and so much flavor in the peel is a shame to discard it. This is such a simple and tasty looking smashed potato recipe! I love it! I know my potato smasher (the hubby) would love it too so it’s been saved! You’ve been cooking up some beautiful food. I get so hungry everytime I come here. I want an order of each please. 🙂 The keyword here is “sour cream”. So delicious. Wow, thank you! What a compliment 🙂 And I totally agree – the keyword is indeed sour cream. I don’t know if it’s my 1/4 Hungarian roots, but I could eat it by the spoonful! I tried this and it was AMAZING!!! I love potatoes and this was such a comfort to me! Oh yay!! I am so happy it came out well, thanks for letting me know Sandra! Me too, I love potatoes. I’ve never used sour cream and I’d love to try this – it is so easy to make! Yes, this recipe is definitely easy! I love sour cream with potatoes, even mashed like this. I hope you give it a try! Oh my, this looks so creamy and delicious 🙂 I love the addition of scallions, too. Great recipe! Thank you Kiri! Yes, the scallions added a nice flavor and crunch. I completely agree! The skins are always my favorite part. Thank you Theresa! Love potatoes of all kinds, and mashed potatoes are right up there. My favorite potato recipes might be Indian, though. There’s something about potatoes cubes sauteed in an onion, ginger, garlic, cumin, coriander, and turmeric slurry that’s wonderful. Mmmm yes I totally agree – I absolutely love potatoes in Indian food! Whether in samosas or aloo ghobi, I adore how they soak up the spices. this is such a great roundup of potato recipe. love your combination too, with sour cream has to taste great ! i love potatoes with spices too..common in indian food. Thank you! The sour cream does add some wonderful flavor and texture. I love the use of potatoes in Indian food!